315024 Features: -Lizard embossed leather material. -One of a kind "lift-up" top presentation tray. -Necklace and bracelet holders hidden behind large mirror in lid. -Pull out ring roll drawer. 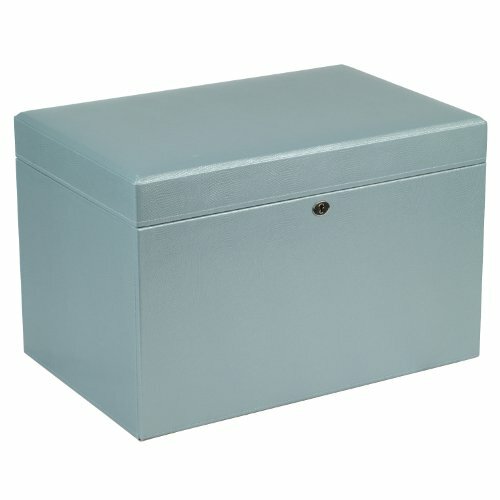 -Bottom drawer stores a removable travel safe deposit case and a mini travel box. -Ice color. Product Type: -Jewelry box. Shape: -Rectangle. Style: -Traditional. Finish: -Ice. Interior Material: -Fabric. Exterior Material: -Leather. Number of Items Included: -3. Drawers Included: -Yes. Mirror Included: -Yes. Doors Included: -Yes. Locking: -Yes. Interior Storage Included: -Yes. Number of Drawers: -5. Door Location: -Front. Interior Storage Type: -Removable tray. Dimensions: Overall Height - Top to Bottom: -11". Overall Width - Side to Side: -16.25". Overall Depth - Front to Back: -10.75". Overall Product Weight: -22 lbs.